This weekend, MZ headed to Little Rock for Kirk and Kim’s Wedding. Kirk and MZ went to college together at the U of A and I’ve gotten to know and love Kim and Kirk through tailgating for Razorback games! Their wedding ceremony and reception was held at the Arkansas Arts Center in downtown Little Rock. All of it was absolutely beautiful! One of MZ’s favorite parts was the mini pizza, as he loves all things pizza! Instead of a grooms cake, there was a gelatto bar, which was also super tasty! We all danced the evening away! After the reception we headed down town with Darla and Kevin (also some of MZ’s friends from college). We wanted to watch the rest of the Cubs game, so we went to Gusano’s – unfortunately they lost, so we moved on. I’m not sure the name of the place where we ended up – and yes, I know that’s probably a bad sign. But we had a blast regardless, really, do you need to know where you are as long as you get home safely! I think not! 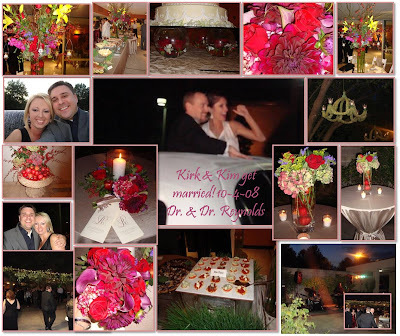 Congratulations to Dr. Kirk and Dr. Kim! What program are you using to create the collages? Beautiful wedding — hopw mine turns out so well! Kevin was hurting on Sunday and even into Monday! Lightweight! We had fun with you guys! See ya soon for Ole Miss!